The IMAX (Image Maximum) cinema is located at the Glasgow Science Centre on Pacific Quay in Strathclyde. It shows 2D and 3D documentary films in a unique setting. The IMAX experience has been tested by more than a billion people in almost 50 countries the world over and it is the ultimate cinema experience. The crystal clear images and the digital surround sound enhance the cinematic experience and let you get carried away by what is happening on the screen and when you consider that the size of the average IMAX screen is bigger than a junior soccer pitch, this can completely change the way we look at the pictures, and even our perspective on the universe. IMAX films have been shot in spectacular locations all over the world, from Mount Everest to the Atlantic floor. The images that they bring back are unforgettable, making the IMAX experience the most powerful cinematic experience in the world. The Sandyford Hotel on Sauchiehall Street is conveniently located for the Science Museum just across the River Clyde. 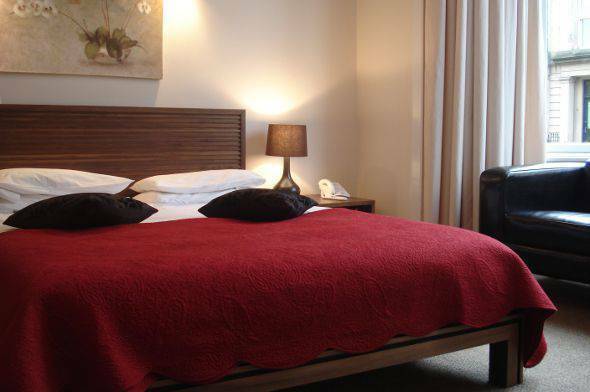 This central hotel, nestled between the City Centre and the West End, has 55 well-appointed and comfortable rooms suitable for people travelling alone, as a couple or with family members. Our B&B rates are very affordable and include a full breakfast. There is 24 hour reception and free Wi-Fi access from every room. For a cheap, family hotel near the IMAX cinema in Glasgow, The Sandyford Hotel is an excellent choice. Call us today on (+44) 0141 334 0000 to enquire about bed and breakfast rates and room availability. We will be happy to advise you on how to get to the Glasgow Science Museum on foot or with public transport. You can also make a booking enquiry with the help of the online booking form on our website. We look forward to hearing from you.